Hey, what’s going on guys? It’s Alex here. I had a thought while I was walking. 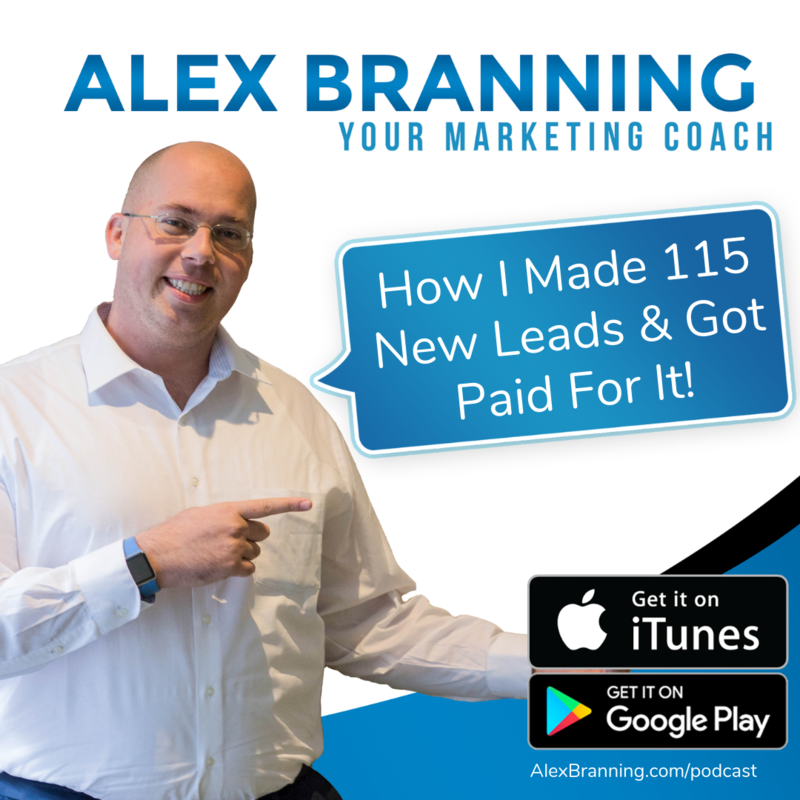 I wanted to share how I just got 115 new leads for my business and it didn’t cost me a dime. Let me share with you how I did it. It’s a beautiful day out here. It’s Friday up in Redding and for those of you that have been following me, you’ve seen me talk about this new summit that ClickFunnels is doing and it’s starting on Monday. It’s a 30 day summit. By the time you’re listening to this, the summit has probably already happened. That’s why they’re my perfect client. Now, Russel and his team have put together this awesome promotion. Where if they accept the challenge and they pay the 100 bucks to join this 30 day challenge, which check out the sales page for more info on that but they put a whole bunch of really cool bonuses in there. It’s just a great, great experience. Anyway, it’s a 100% affiliate commissions. If they sign up for the challenge for a 100 bucks, I get a 100 bucks. So I looked at this, I looked at what they were doing, who they were attracting, what they were teaching and the affiliate commission. I thought, man I got to go big on this. I got to really make this thing happen. And so I put together a Facebook ad campaign. I put together an email campaign. I reached out to the people that are already in my list and I started promoting the heck out of it. So right now as I’m talking to you, I have a 115 people that signed up through my landing page. That said, “Yes, I want to take part in this.” Which is really amazing. 115 people that said, “This is me. Where I’m at right now.” So they raised their hand and said, “Alex, I’m the exact person that is interested in the summit.” That’s phenomenal. I got a 115 new people to talk to, reach out to, market to and serve and support. It’s great. Then, nine of them took the challenge so I earned $900 in affiliate commission. I spent a couple hundred bucks advertising, I did email and it’s been working like really well and I made $900. I spent about $200. I’m going to be giving everyone that signed up a cool bonus that’s going to cost me another couple hundred bucks. But I got all these great leads and I made money while I was doing it. That’s the online marketing game. It’s all about finding that offer. In this case it was an affiliate offer. It’s about finding that offer that is attracting your type of person. Then you earn the trust and comfort level of the prospect and now you’re in a position to sell. Because everyone that went through that I’m going to do, I’m going to send them a link where I’m basically talking about, hey let’s over the next 90 days, let’s build this out as a team. And I’ll give them an offer to join my inner circle which is going to be a high end coaching program. I’ll probably make another couple sales from that. Triple my profits from this whole thing. Take on some new coaching clients and this opportunity, this 30 days challenge opportunity, came across my desk. I took massive action and I’m going to get a massive return. There’s opportunities right now that are in front of you. I don’t know what they are. You’ve seen them come across your desk. Maybe it’s someone that wants to partner with you. Maybe it’s an event that you can sponsor. There’s something that is on your desk right now that’s a major opportunity for you to get a lot of really good leads at almost no cost. I got super lucky because I was able to actually make money on it which is the beauty of affiliate marketing by the way. But there is opportunities and you have to take action. You have to move and move quickly and take big steps so that you can actually see the results of the opportunity that’s in front of you. One other example as I’m walking I’m remembering this. Somebody else, I just told you about an affiliate opportunity that came up where I took massive action and I made a huge win. I had another one, I was invited to speak at an event in San Diego. I was invited, he was like, “I want you to speak Sunday morning.” Well he asked me Saturday at 2:00 PM. Somebody had dropped out the very last minute and they thought of me. Now I live three and a half hours away from San Diego. But I’ll tell you what, I got up early in the morning, drove down there, I gave a 30 minute speech off the top. I didn’t have any time to really prepare. I just did it. I knew that I needed to do it. I knew I needed to be there. I knew I needed to take that and I did. Out of that one speech I probably made connections and sold services that were right around the $20,000 range, give or take. Just a major, major move for me and I had to take massive action, huge risk, a lot of time and drive all the way down to San Diego at the drop of a hat so that I could take on that opportunity. But if I hadn’t done that, I would’ve left over 20 grand on the table. This one, this opportunity, it’s not a $20,000 opportunity, at least not yet. It might be. But, few thousand bucks. It’s a major profit and it’s only going to get better. That’s the fun part. It’s only going to get better. I’ve made 900 bucks so far, it’s only going to get better. But I needed to take that massive action and do it. I just want to encourage you right now, there’s opportunities on your desk where there’s massive amounts of upside with some risk. Take it. Take the opportunities that have that huge ceiling because you never know, this particular opportunity won’t come back again. This 30 days challenge, this is not going to, once this is over, it’ll probably still be a promotion that they can do but it’s not going to be the same. So now, I took advantage of it. I was able to jump on this and I am reaping the rewards. Go for it you guys. Take that action. Have a good day.